For this week’s recipe I am sharing with you something which I have recently created, so as you can imagine, I am super excited! 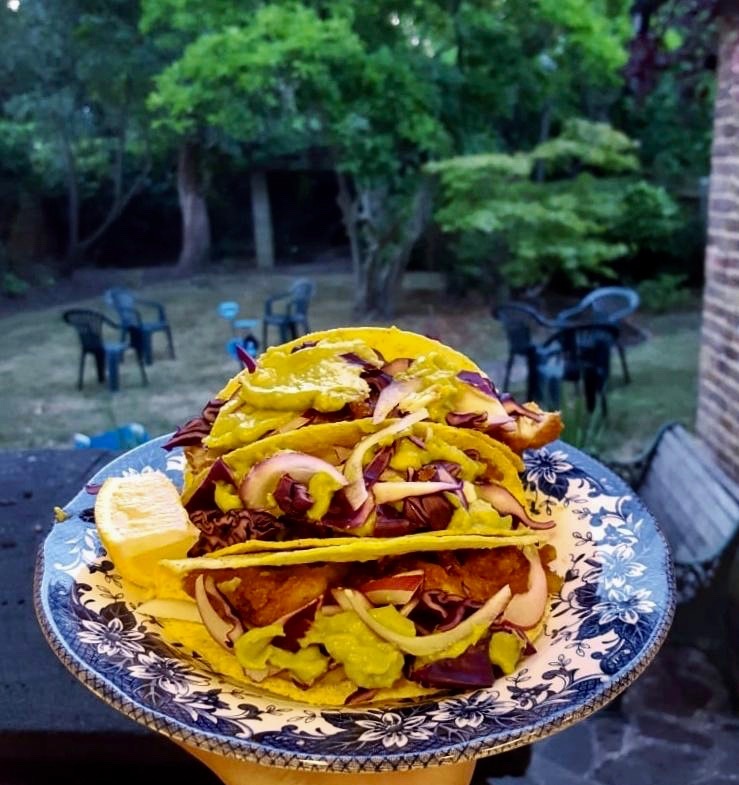 I originally wanted to name the recipe ‘purple fish tacos’ because those are the main colours you see due to the vegetables I have incorporated, which made me super excited because purple is my favourite colour. However, deep fried fish tacos just sounds better! So I was rummaging through the freezer trying to find something, and I saw some left over Haddock fillets, and I had two options in mind, I could either make a burger or tacos. Tacos sounded like a more fun idea so that’s what I went with! I really love the fish tacos they do at Wahaca, one of my favourite Mexican restaurants in the city. Therefore, this is where a lot of my inspiration comes from, especially the purple inspo because those are mainly the kind of ingredients they put in! So lets start with the cooking process. You want to start making this recipe by making the batter for your fish. You will need to mix your dry ingredients together, and then your wet ingredients and then slowly combine them together. So firstly, in a bowl, put half a cup of plain flour, one forth cup of corn flour, one teaspoon baking soda, a pinch of salt and pepper and mix that all together. Additionally, you can add other spices depending on how you want your batter to taste. I had bought a Nandos inspired spice mix from Sainsbury’s which I added to it (I love my spice). In another bowl take one egg, one teaspoon of olive oil and half a cup of water and whisk all of that together, these will be your wet ingredients done! Next slowly incorporate your wet mixture to the dry, making sure you keep mixing it while you do. However if you are in a hurry, you can also mix everything up in one bowl, but make sure to mix really well after each ingredient you add. Once your batter is ready, cut your fish fillets up into strips (I used three fish fillets to which made six tacos) and let them marinate in the mixture. You want to let the fish sit for about twenty minutes before deep frying them. In the mean time you can work on your fresh ingredients. 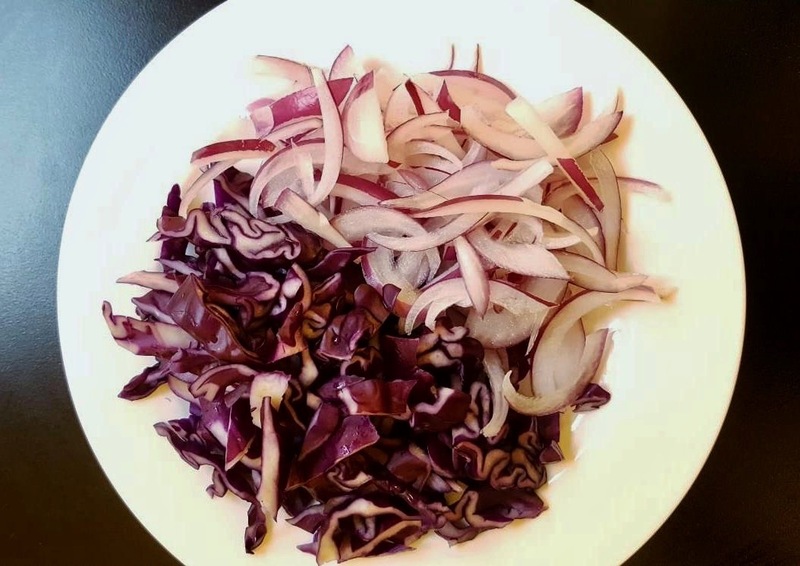 Finely chop up your purple cabbage and red onion length wise, and if you are preparing fresh gauc, get this ready in this time as well. I just used pre-made gauc this time! Once you have let your fish soak up all the delicious spices, heat up a deep frying pan, or a more shallow frying pan and fill it half way with oil. I know it sounds like a lot of oil, but this will ensure the fish properly fries in the batter. It should take only a few minutes for your fish to fry, and when its golden brown you can take it out and put it on a kitchen towel so it soaks up the excess oil. Next, its time to assemble your taco! Take your taco shell and add on some mayo, this will help everything to stick and stay inside the shell. Next put in your fried fish strips, you can cut them into smaller pieces if they are too big for the shell. On top of this, add your red onions and pruple cabbage, and a dollop of guacamole. I also added on some chilli garlic sauce, but its delicious without it too! So that’s your deep fried fish tacos completed! ← Exclusive Preview: Will Young @ Quaglino’s.